So there’s this (ahem) large coffee chain that I generally try to avoid – at least their food. Because honestly, it’s pretty hard to find anything truly healthy on the menu. There’s a lot of fake healthy stuff, but not much you can grab and not shudder about when you read the nutrition info as you inhale it (is that just me?). 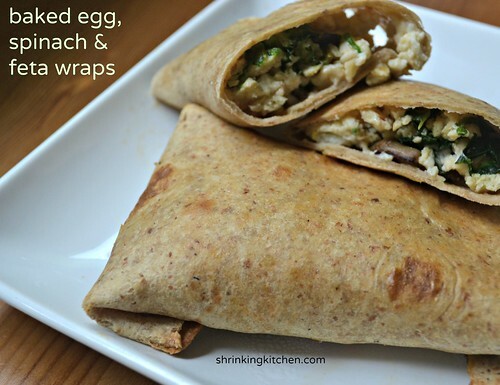 One of my favorite things is an egg white and spinach breakfast wrap, which is toasted and really delicious. And it comes in at under 300 calories, which for ‘fast food’ is pretty incredible. I’ve even been known to grab one of these wraps for lunch, in a pinch. Now my other problem. The price. Because I add my iced coffee (unsweetened) into the mix, we’re talking about six bucks a shot. Not crazy expensive, but I’d consider it a treat. How do I feed my craving without breaking the bank? Make them of course! And the added bonus? My version came in under 300 calories as well…but you get to eat TWO wraps. Ha. Play around with fillings. I love the briny tang of feta, but if you’re not a fan, throw in some cheddar. Roasted red peppers would be wonderful too. You can make these the night before and bake in the morning, or prebake them, then just reheat in the oven for a few minutes when you’re ready to eat. And just in case you were wonderful how to fold these bad boys, I present a visual…enjoy! Heat olive oil in a non stick skillet. Add the mushrooms and green onion. Saute until onions are soft. Throw the spinach in and saute and stir until wilted. Season with salt and pepper and remove to a mixing bowl. Wipe out your skillet and put it back on the heat. Whisk the eggs and egg whites, then pour into the heated pan. Cook your eggs, stirring often, until they're cooked. Add the eggs to the bowl with the vegetables. Chop up the sun dried tomatoes and add them to the bowl, along with the feta. 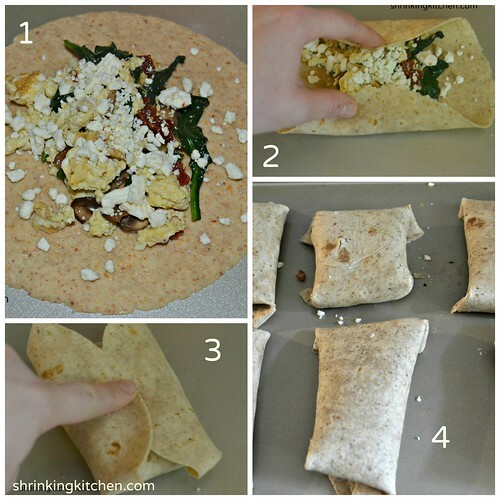 Lay out your tortillas on a cookie sheet. Divide the egg/vegetable mixture amongst the tortillas. Fold up the tortillas (see pictures above) and place on the cookie sheet seam side down. Spray lightly with olive oil spray (you could also brush with olive oil). Bake in the oven for 20-25 minutes till the tortillas are light brown and crisp. If you don't eat all your burritos, store them in a zip top bag in the fridge and reheat in a 350 oven for about 15 minutes when you're ready to eat. Hi Mary! Sorry for the late reply, just saw your comment. Yes, I do. I would wrap each one individually in plastic wrap and then place in a large freezer bag. Remove and bake as needed!